INTRODUCTION: The purpose of this study was to evaluate technical and non-technical operative skills of professional surgeons in real clinical settings, performing open and laparoscopic general surgical procedures. There has been recent interest in the evaluation of technical and non-technical skills in clinical settings and their relationship to outcome. While technical skill measurement tools have been used increasingly in clinical education settings, non-technical skill assessment is a relatively new concept to surgery which has not been previously evaluated. Neither has been assessed with respect to patient outcome. METHODS AND PROCEDURES: General surgeons in Ontario who perform colorectal cancer operations formed the basis of the present study. A single trained observer performed evaluations within the operating room during a single surgical procedure. The global rating scale of the Objective Structured Assessment of Technical Skill (OSATS) tool and the Non-Technical Skills for Surgeons (NOTSS) tool were used to assess technical and non-technical skills respectively. RESULTS: Twenty-five surgeons practicing in academic hospitals were assessed. Tables 1 and 2 demonstrate the OSATS and NOTSS scores. No significant statistical difference in OSATS or NOTSS scores was found between open and laparoscopic cases. 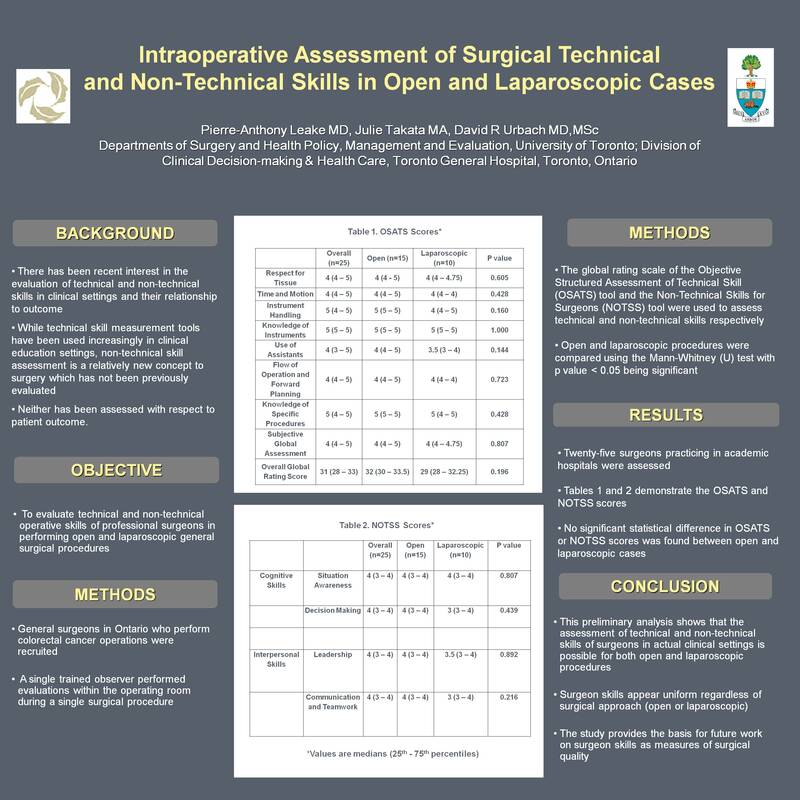 CONCLUSION: This preliminary analysis shows that the assessment of technical and non-technical skills of surgeons in actual clinical settings is possible for both open and laparoscopic procedures. Surgeon skills appear uniform regardless of surgical approach (open or laparoscopic). The study provides the basis for future work on surgeon skills as measures of surgical quality.